With this warmer November weather, we’ve seen a change in the types of nocturnal wildlife that we’re seeing in and around Kingfisher Bay Resort. The Wallum is one of the many different eco-systems on Fraser Island and is characterised by floristically-rich scrubland and healthland on deep, nutrient-poor, sandy soil (thanks Wikipedia for the definition!). At Kingfisher, you’ll find the Wallum area just in front of our main Centre Complex and hotel centre complex and some of our villas border it as well. Guests are free to explore the Wallum at their leisure on our timber boardwalks, which wind their way past the mirror lakes – it’s a great spot to see our local birdlife diving for insects across the purple-hued waters first thing in the morning; or where you might catch a glimpse of a carpet python sunning itself in the bush. Or you can head out on one of our many Ranger-guided eco walks. In November, our beautiful native frog species become more active and vocal from their home in the Wallum! Of an evening the air is filled with a chorus of calls made by striking Striped Rocket Frogs, energetic Wallum Rocket Frogs and dainty Cooloola Sedge Frogs. Throughout the warmer months we marvel at the sounds made by these amazing amphibians and watch with childlike excitement as they bound across the Wallum boardwalks right in front of our eyes. Our Junior Eco Rangers love it too. The resort’s main road has also been a mecca of activity with the return of regular sightings of Tawny Frogmouths. These graceful nocturnal birds could be seen perched in roadside Eucalypts waiting for the streetlights to lure in a tasty insect meal... and as we reported in our bird report for last month - our Tawny Frogmouths have been seen out and about with a new chick – we’ll be following their progress closely and will keep you updated. Bandicoots were also regularly spied rustling around under the fluffy foliage of the Fox-tail Sedge. These curious marsupials busily dig for crickets, worms and tubers of a night time, leaving tell-tale holes in the sandy soil around the resort. The marine life around the jetty at Kingfisher Bay was spectacular this month as a gorgeous Green Sea Turtle (pictured above - special thanks to greenpack for the use of their photo) was spotted several times throughout the month. This magnificent creature comes to feed and sleep under our jetty from time to time and it is always a night walk highlight to see it momentarily surface for a gulp of air. And on Fraser Island's western sea shore thousands of Soldier Crabs have been busily feeding at the water’s edge – it really is a spectacular sight. Catch you next time, tree huggers, Ranger Kat. Sorry for the lateness in getting this blog to you - spring is such an exciting time for birding and this October was no exception – so we’ve been away from our desks and out on Fraser Island, wandering the wallum and seashore with guests in search of new and exciting feathered friends to add to our burgeoning bird count! This month we’re pleased to report that Kingfisher Bay Resort’s resident Grey Shrike Thrushes are nesting for a second time this season. Each year we bear witness to the development of their young from just eggs; to noisy chicks constantly nagging for food; to anxious fledglings that can’t wait to explore their new surrounds; and to the adults that that become part of our Kingfisher family. To experience this breeding cycle twice in such close succession is a real treat and we’ll keep you posted with the progress of the new families over the coming months. If you’ve visited Kingfisher, chances are you’ve seen these intelligent birds around our Centre Complex area and in the Wallum. Working in pairs, they’ve perfected the art of the ‘fly by’ to gain access to our main reception and Maheno areas – one flies past the sensor to activate the doors and the other zips inside. In other egg-citing news, a pair of Tawny Frogmouths has also produced a chick, which we spied early one morning on our Ranger-guided Bird Walk around Kingfisher. This small fluffy ball of down was spotted testing out its wings under the watchful eye of both parents. Although these birds are nocturnal, the new addition to the family means little sleep for attentive parents. The Wallum lakes – within a stone’s throw of the resort - sported a flurry of activity this month with Red-backed Fairy-wrens, Noisy Friarbirds, Lewin’s Honeyeaters and Bar-shouldered Doves all sighted in and around the lake banks. A new addition – a Darter - made a cameo appearance much to our delight. This graceful bird was spotted on several bird walks either wading through the tea-coloured water in search of a meal, or perched in a lakeside Paperbark - wings outstretched, drying off in the warm morning sun. 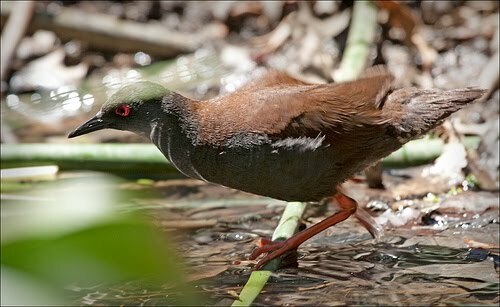 The Wallum was definitely the place to be this October with our most exciting sighting of a species never before recorded on our bird walks - a Spotless Crake (pictured above, beautiful photo courtesy of aadvark on Flickr) – and right in front of our Hervey Bay Bird Watching Group – we couldn’t have planned it better! This pint-sized wader had bird watchers spellbound as it surreptitiously emerged from amongst the vegetation for a look around, before quickly darting back under cover. This was a rare and special sighting of this uncommon and nomadic species. We can’t wait to see what November brings… until then this is Ranger Kat saying hooroo. October brings with it a distinctive spring peak a clear balmy evenings, a delight for our night time wildlife and our Kingfisher Bay guests on our night time nature walks in and around the resort. An abundance of blossoms, berries kept our resident bats bedazzled for hours each evening. 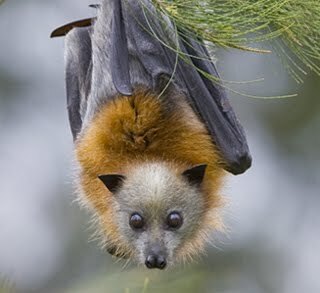 The beautiful Grey Headed Flying Fox (pictured. Photo courtesy of Ku-ring-gai Council) was most commonly seen hanging upside down, scrambling through the masses of nectar filled blossoms, whilst the gracious, yet erratic, flight of the much smaller Micro-bats flew silently above in search of their next meaty bug meal. Cautiously sharing the hunting grounds of the trees are the Gliders – one of the most popular animals with our night time walkers. These small yet aerobatic possum like creatures spend their nights launching themselves off high branches, gliding up to 50m before landing, gripping and sprinting up the trunk of the tree into the cover of the food filled branches. The most commonly seen on the western side of Fraser Island are the Sugar Glider and Squirrel Glider, which are about the size of your hand, however the smaller and more illusive Feather-tailed Gliders are the size of a match box and a spectacular sight when seen. 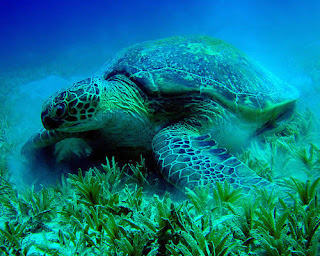 The Great Sandy Strait is also filled with mysterious and marvellous creatures. However night time brings the weird and wonderful to the shallows for our viewing. Torch light reveals techno-coloured Squid, which have the ability to change into a moving circus of lights, colours and patterns. Stingrays were on the hunt for hidden crustaceans buried in the sand and are fascinating to watch from above. Using their highly developed sensory glands around their mouth they’re able to pick up even the tiniest of electrical current produced by living creatures in the balmy waters around them. Night time feeding frenzies are a sight to be seen from the Kingfisher jetty, as schools of bait fish are targeted by larger lurking predatory fish. This month was filled with the wonders of Fraser Island’s night life and the clear star filled sky was the cherry on top. Stay tuned for our bird report coming soon to a blog near you – cheers Ranger Kelly.